The Carlisle A.C.T. ALL CONDITIONS TYRE gives riders the ability to drive virtually anywhere, whatever the terrain. The A.C.T. 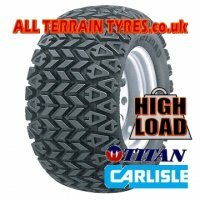 tyre features new radial construction technology, giving much greater casing flexibility over traditional crossply or bias belt ATV tyres. This means softer sidewalls which absorb the shocks from bumps and ruts and a larger contact patch that actually grows under load resulting in increased traction just when it's needed. Rider fatigue is greatly reduced due to the lighter and more precise steering coupled with an amazingly smooth ride. The Carlisle A.C.T. radial quad tyre is Original Equipment fitment to several Bombardier Can-Am Outlander models.